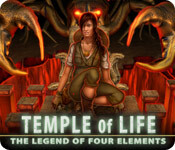 After an archeologist releases the element of water, it's up to you to restore the balance of the elements in Temple of Life: The Legend of Four Elements! Scour Hidden Object scenes and solve perplexing puzzles to save the entire world! Find the artifacts and work as quickly as you can to stop the damage being done. Can you track down the element of water before it's too late? Find out in Temple of Life: The Legend of Four Elements!